Ever since Emelyn was a little girl she has dreamed of becoming a princess, and now that dream is a reality. She is honored to have the opportunity to bring magic to little girls and boys on their special day. Emelyn has been a performer ever since she was little, taking dance lessons and putting on performances in the living room. She has been cast in the musicals Willy Wonka and the Chocolate factory Jr., Hairspray, and Still Life With Iris where her acting and singing skills had the opportunity to grow. 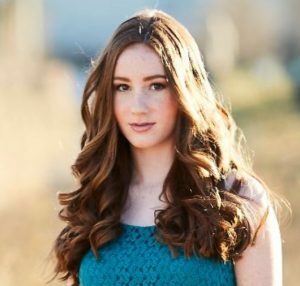 In addition to participating in a Cherry Creek District choir she has taken voice lessons with Ellen Smith, attended both the 2017 and 2018 State Thespian Conference, and has taken five years of theater classes in order to fine-tune her skills as a performer. Being a babysitter for several years she feels comfortable around young children and is excited to bring smiles to their faces. Emelyn has always looked up to the princesses of her childhood which taught her how to be brave, kind, and selfless. Through this experience she hopes to pass these morals down to the younger generations though the magical memories of meeting a real live princess.